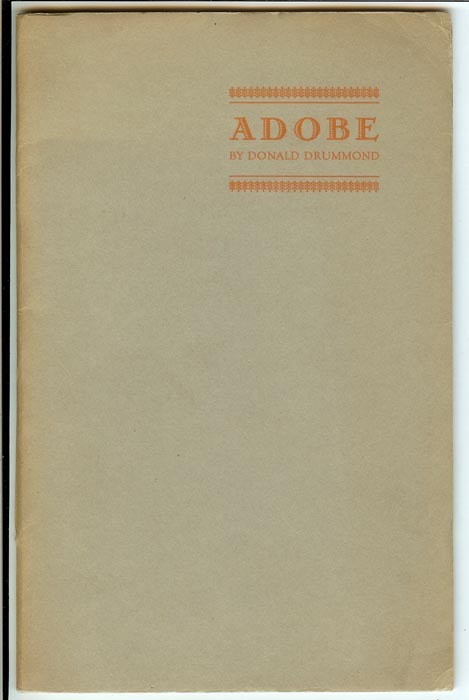 ADOBE by Donald Drummond. Greeley, Colorado, 1938. 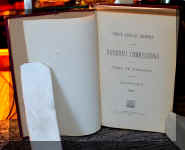 Two hundred copies of this edition were printed for the author at The Press of Colorado State College of Education, Greeley, in August, 1938. Copy number 75. Original printed wrappers; 31 pages. Colorado poetry. Near fine condition. 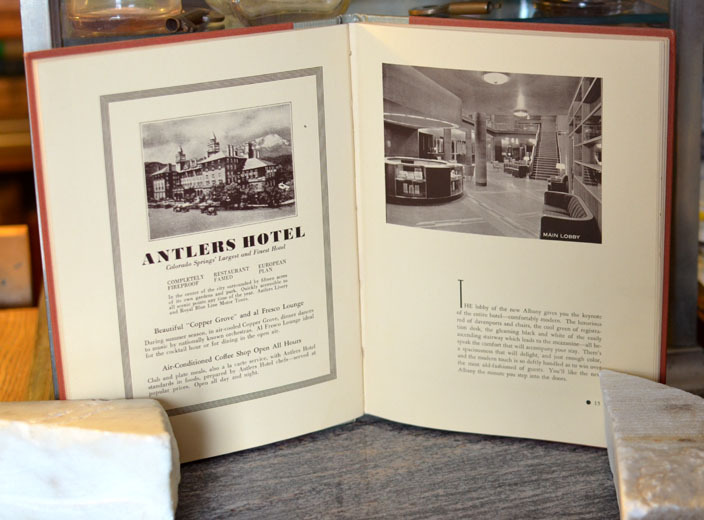 THE HISTORY OF THE ALBANY HOTEL, Denver, 1938. Allied printing, Trades Council, Union Label, Denver, Colorado. 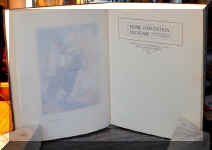 Original two-tone hardcovers: silver binding; tan boards. 63 pages. 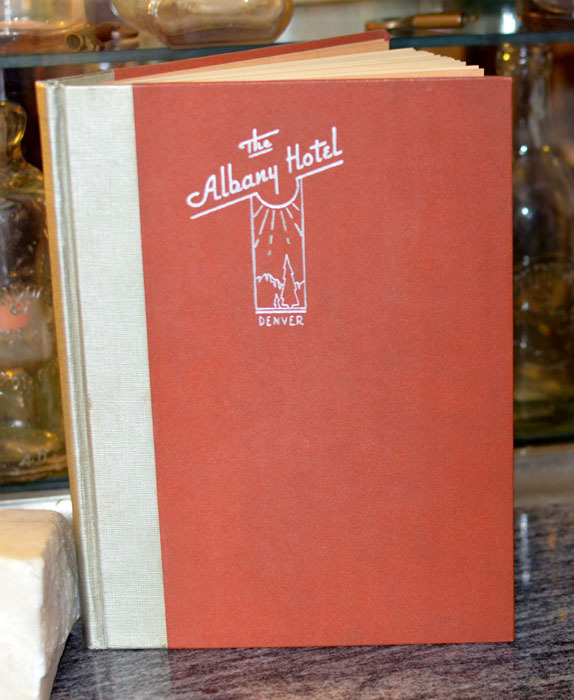 10 pages of Albany Hotel history; the rest includes Denver and surrounding area history and sites. Local advertisements. Numerous photographs. Tourist information. Denver amenities. Condition of book: very good plus to near fine. 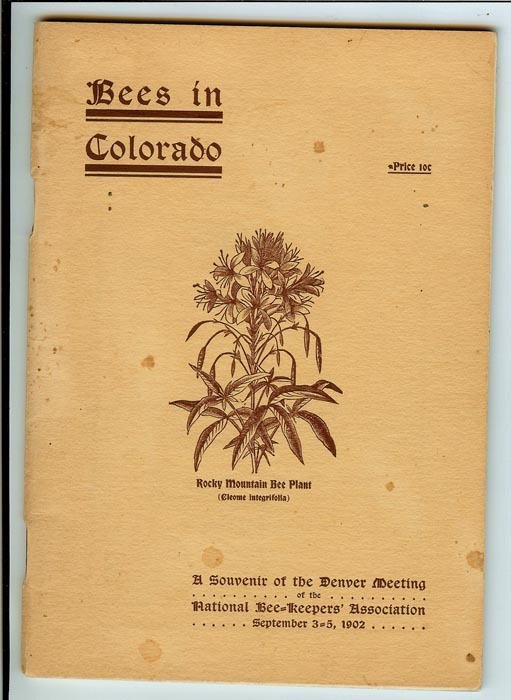 BEES IN COLORADO, A Souvenir of the Denver Meeting of the National Bee-Keepers Association, September 3 - 5, 1902. SOMETHING ABOUT THE BEE INDUSTRY IN COLORADO. Gathered and Worked over by D.W. Working. "Warranted Pure." Signed by Working. The App-Sutherland Engraving Company, Denver, Colorado. 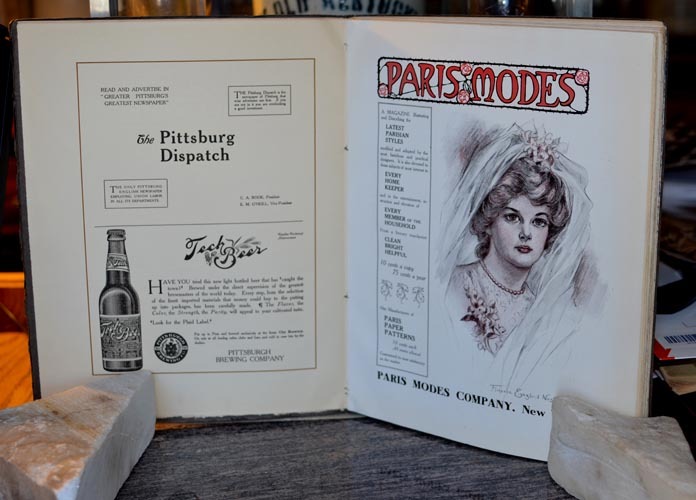 Original tan printed and illustrated wrappers; 48 pages, illustrated. 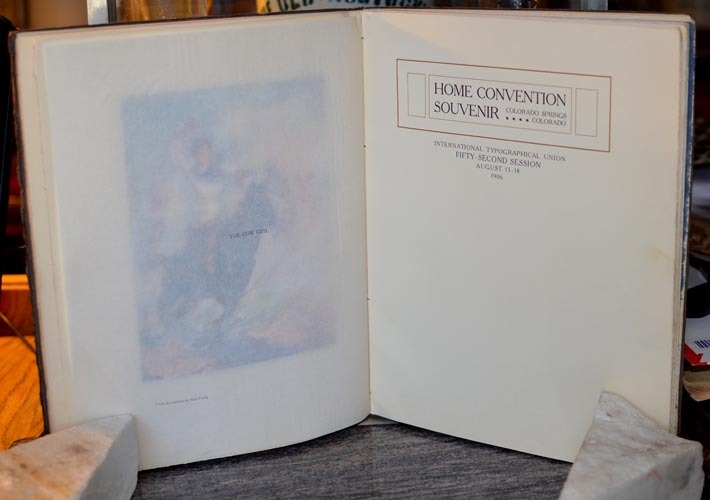 Contents include: The Bee Industry in Colorado, Scraps of History; Colorado Agriculture by H. Knight; Later History; Colorado's Honey-Producing Industry by D.W. Working; Some Later Figures; A Talk with a Pioneer; Bees in Boulder County; Jefferson County; Grading Rules of the Colorado State Bee-Keepers' Association; Bee-Keeping in Delta County; Bee-Keeping in Larimer County. Illustrations of bee-keeping operations throughout the state. Local advertisements. Condition: very good plus. Enamel-coated pages. BIENNIAL MESSAGE OF GOVERNOR CHARLES S. THOMAS AND INAUGURAL ADDRESS OF GOVERNOR JAMES B. ORMAN to the Thirteenth General Assembly of the State of Colorado, 1901. Denver, Colorado: The Smith-Brooks Printing Company, State Printers, 1901. 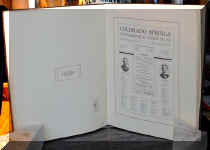 Original light gray printed wrappers; 122 pages. Governor Thomas's address is covered in the first 95 pages. Twenty-seven pages are devoted to Governor Orman's inaugural address. Ex-library; some light markings throughout. 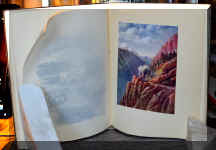 Condition: very good plus, generally; back wrap and last two pages (which are blank end-papers) have large chip missing. 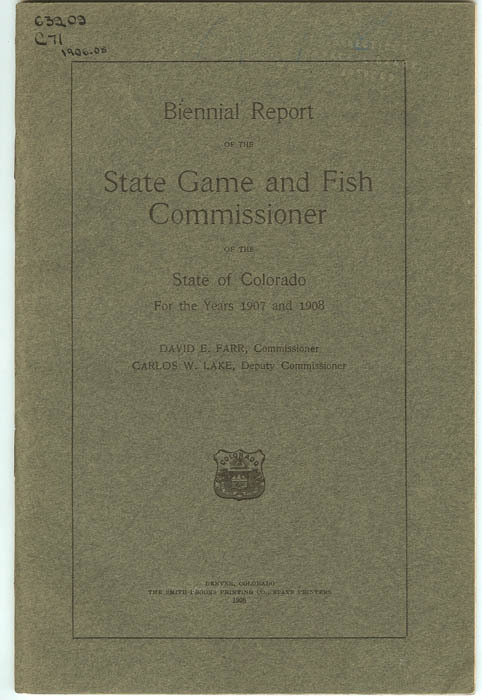 BIENNIAL REPORT OF THE STATE GAME AND FISH COMMISSIONER OF THE STATE OF COLORADO For the Years 1907 and 1908. David E. Farr, Commissioner; Carlos W. Lake, Deputy Commissioner. Denver, Colorado: The Smith-Brooks Printing Company, State Printers, 1908. Original green printed wrappers; 36 pages, several illustrations. Tipped in "complimentary" of David E. Farr. Report of wildlife and environmental interests. Condition: near fine; several unobtrusive library marks. 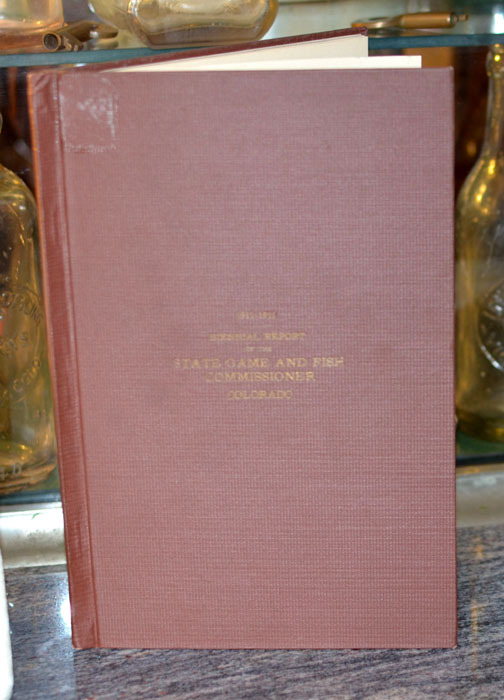 Shinn, James A. BIENNIAL REPORT OF THE STATE GAME AND FISH COMMISSIONER of the STATE OF COLORADO, For the Years 1911-1912. Denver, Colorado: The Smith-Brooks Printing Company, State Printers, 1912. Original brown cloth covers; 33 pages. 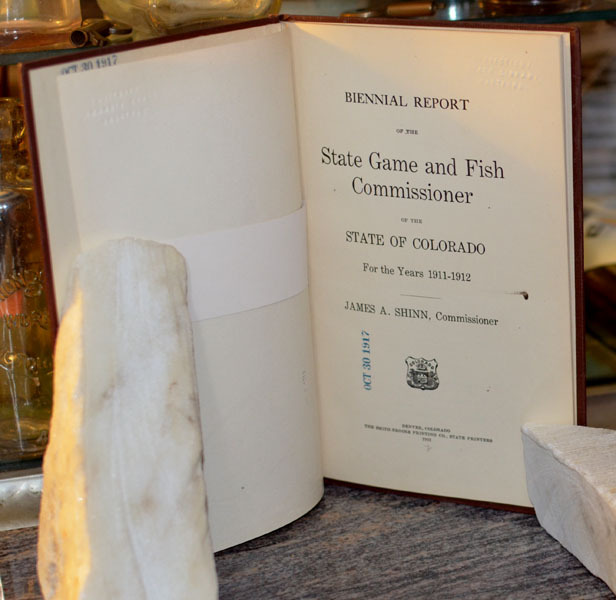 Tipped in slip, "Compliments of James A. Shinn, State Game and Fish Commissioner of Colorado." Excellent book for researching contemporary environmental concerns and wildlife interests. Reports on elk, deer, mountain sheep, games birds, antelope, etc. Also on maintenance, appropriations, poaching, etc. Condition: very good plus; ex-library with a few unobtrusive markings. Fraser, Walter B. BIENNIAL REPORT OF THE STATE GAME AND FISH COMMISSIONER of the STATE OF COLORADO, For the Years 1915-1916. Denver, Colorado: Eames Bros., State Printers, 1916. 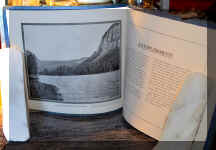 Original blue stiff wrappers; 32 pages; photographic illustrations. Excellent book for researching contemporary environmental concerns and wildlife interests. 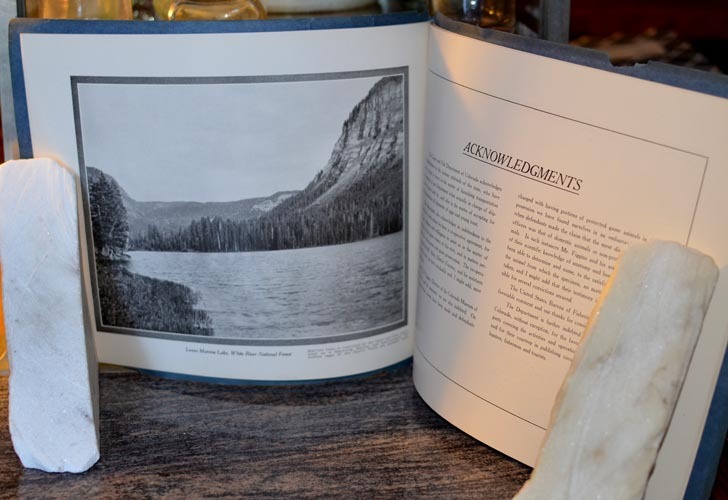 Reports on elk, deer, mountain sheep, games birds, antelope, etc. Also on maintenance, appropriations, poaching, etc. Condition: very good plus; ex-library with a few unobtrusive markings. 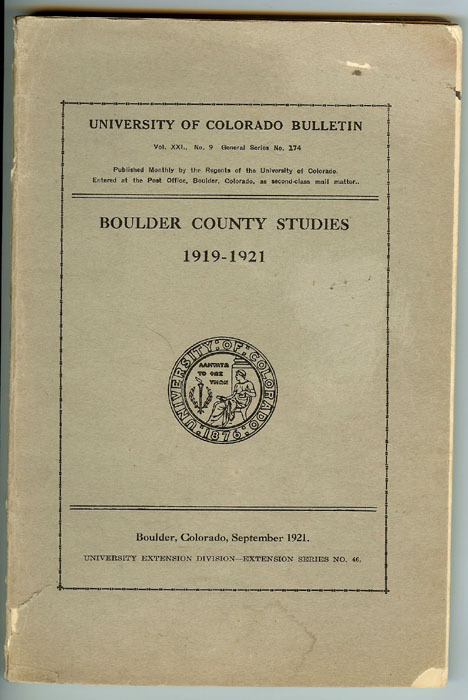 BOULDER COUNTY STUDIES: A Series of Studies on Health, Sanitation, Recreation, Relief, Municipal Administration and Business. Under the auspies of the University Extension Division, University of Colorado and the Mountain Division of the American Red Cross. Boulder, Colorado, September 1921. University Extension Division -- Extension Series No. 46. University of Colorado Bulletin, Volume XXI, No. 9, General Series No. 174. Original gray printed wrappers; 167 pages. 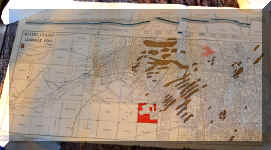 Contents include: Vital Statistics; Child Welfare Studies; Health Agencies; Hospitals; Town and City Water Supplies, Boulder County; Sewers; Privies, Wells and Cesspools; Milk Supply, Boulder County; Report on Results of Inspection of Various Food Handling Places; Family Work Agencies, Public and Private; Study of 251 Families Receiving Some Sort of Outdoor Relief; Methods of Work; Recreation; Findings in Business and Industry; Municipal Administration, etc. Photographic illustrations. Condition: very good. 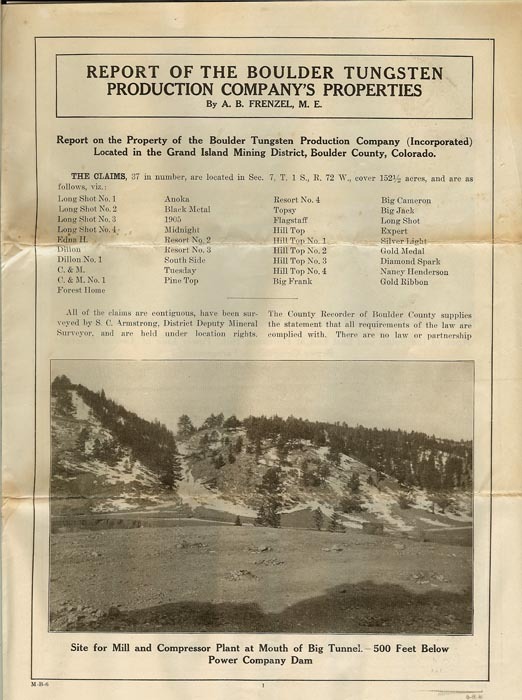 REPORT OF THE BOULDER TUNGSTEN PRODUCTION COMPANY'S PROPERTIES by A.B. Frenzel, M.E. Located in the Grand Island Mining District, Boulder County, Colorado. 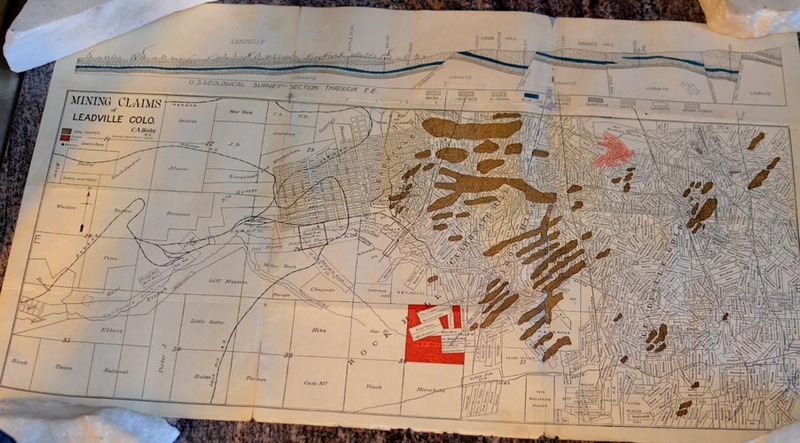 Eight pages, with mining map of properties and numerous photographic illustrations. 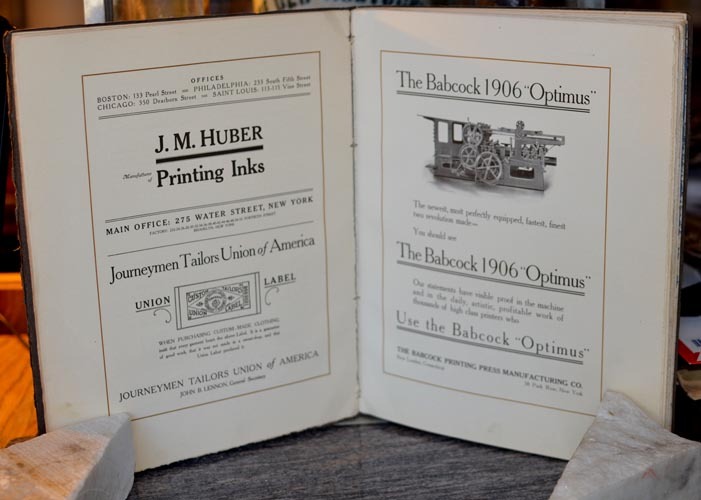 Printed by H.L. Barber & Co., Fiscal Agents, Great Northern Building, Chicago. 1912. Condition: near fine. 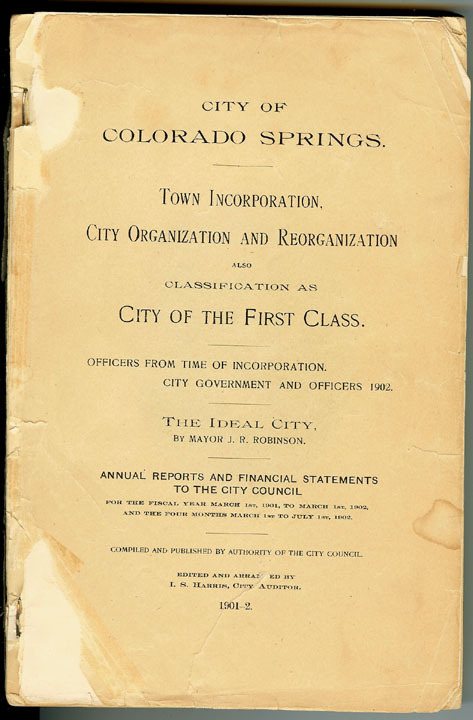 CITY OF COLORADO SPRINGS: TOWN INCORPORATION, CITY ORGANIZATION AND REORGANIZATION also Classification as CITY OF THE FIRST CLASS, 1901-02. Officers from Time of Incorporation. City Government and Officers 1902. 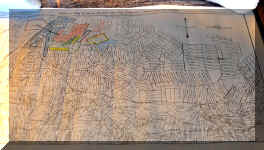 The Ideal City by Mayor J.R. Robinson. 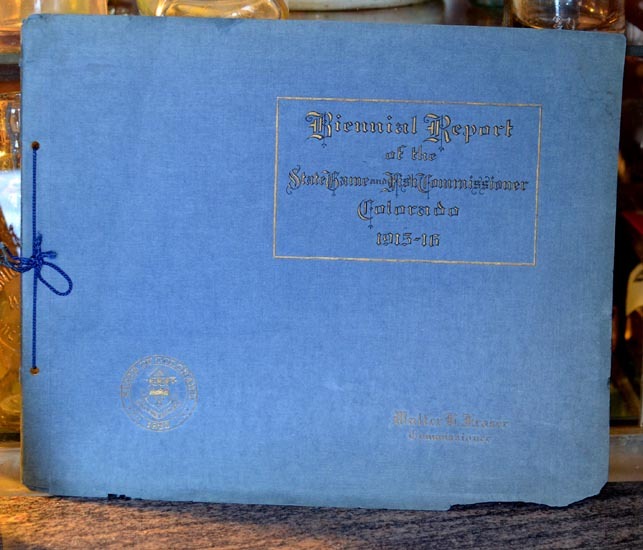 Annual Reports and Financial Statements to the City Council for the Fiscal Year March 1st, 1901, to March 1st, 1902, and the Four Months March 1st to July 1st, 1902. Compiled and Published by Authority of the City Council. Edited and Arranged by I.S. Harris, City Auditor, 1901-2. Publication is missing original printed gray wrappers. 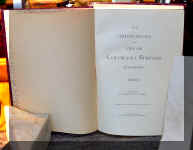 Publication has 264 pages; however, several of the index's last pages are missing. 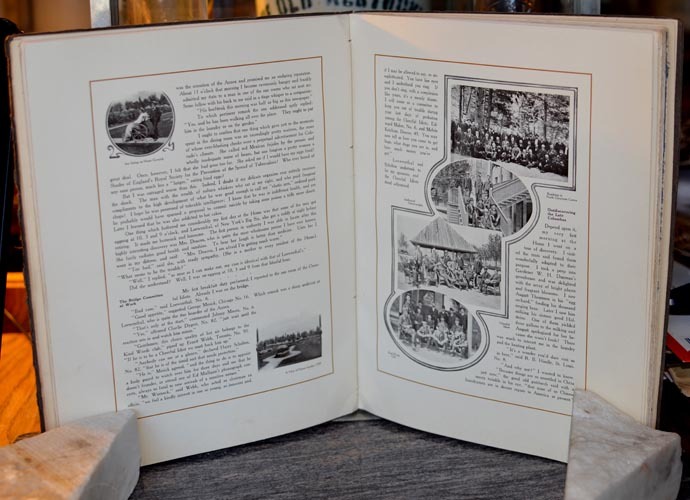 Otherwise, publication has all reports and statements; all photographic plates of officers of City Governments, police and fire departments, street department scenes, electric tramway system, and bridges. Condition overall: good plus to very good. 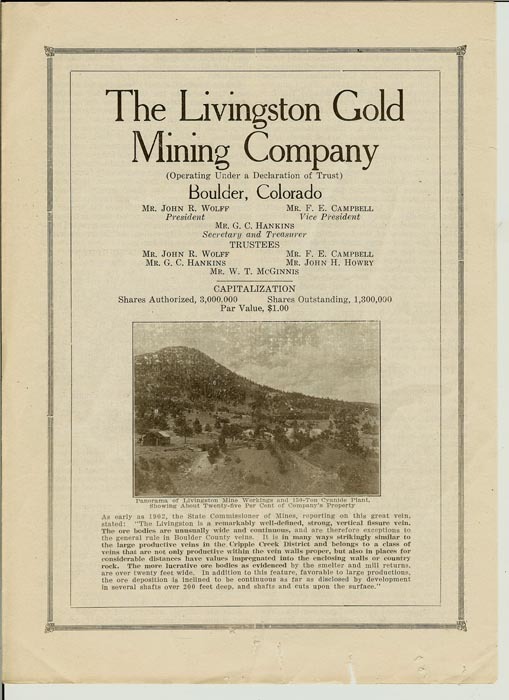 THE LIVINGSTON GOLD MINING COMPANY, Boulder, Colorado, 1918, prospectus. G.C. Hankins, Secretary-Treasurer. Original 4-page prospectus; 1 illustration. Properties located in the Sugarloaf District of Boulder County, Colorado. Detail of property and development work. Very good plus condition. 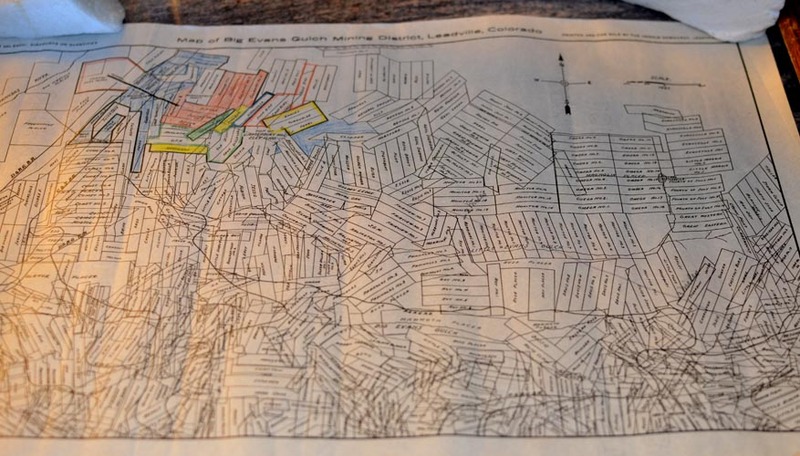 MAP OF BIG EVANS GULCH MINING DISTRICT, Leadville, Colorado. Printed and for sale by The Herald Democrat, Leadville, Colorado, circa 1910. 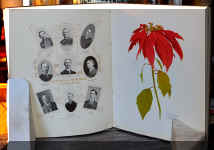 Dimensions: 18-1/2 inches wide by 12 inches in height. 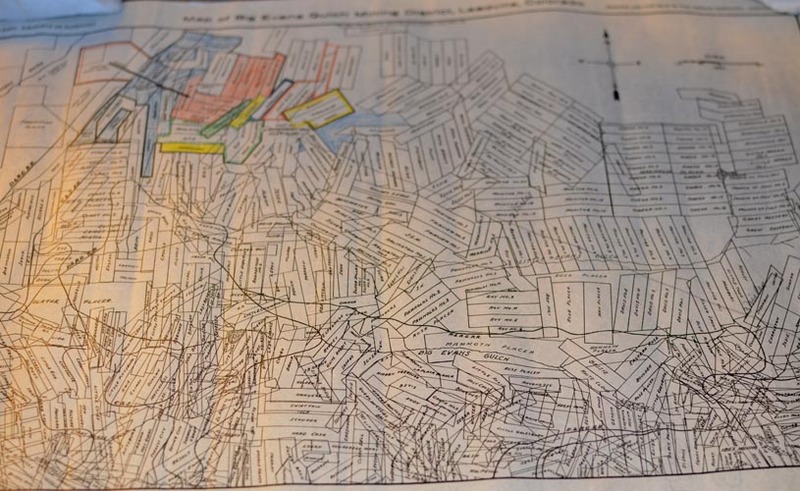 Map shows mining claims, placers, railroads, and part of City of Leadville. Condition: near fine. 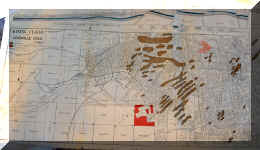 MINING CLAIMS OF LEADVILLE, COLORADO, by C.A. 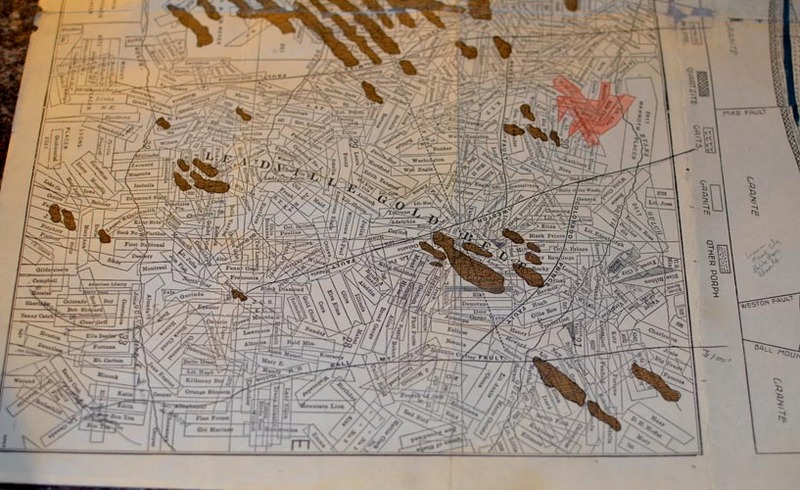 Bohn, M.E., circa 1900, with geological profile and section of City of Leadville. No publisher or printer. Dimensions: 24-1/2 inches in width and 14 inches in height. 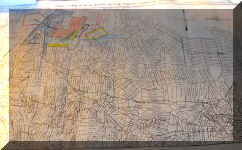 Map shows City of Leadville, mining claims, placers, identifies topographical hills, railroads, and ore deposits. Condition: very good plus. 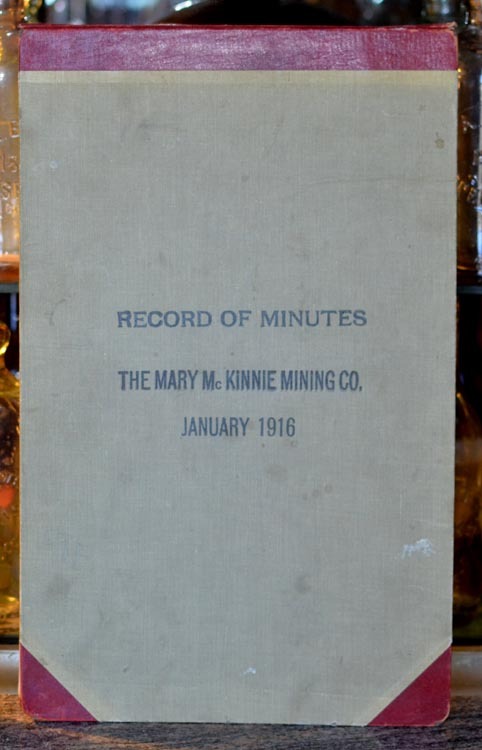 RECORD OF MINUTES: THE MARY McKINNIE MINING COMPANY, January 1916 to January 1929. 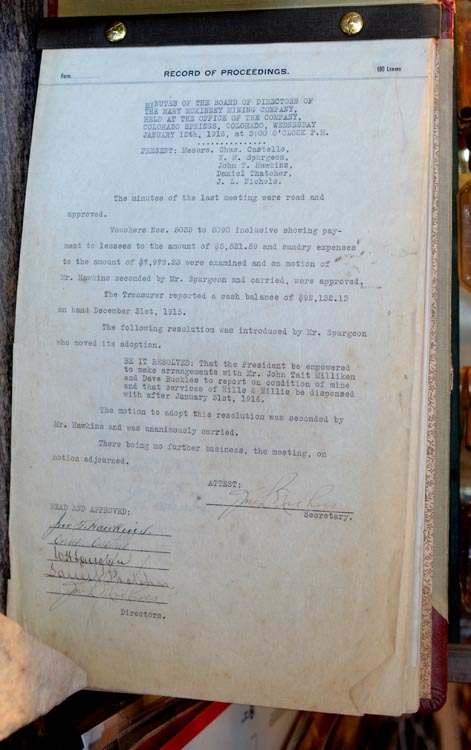 This ledger is the original meeting minutes of the Board of Directors, with decisions made by the Board and originally signed by the Board at the end of each recorded meeting. 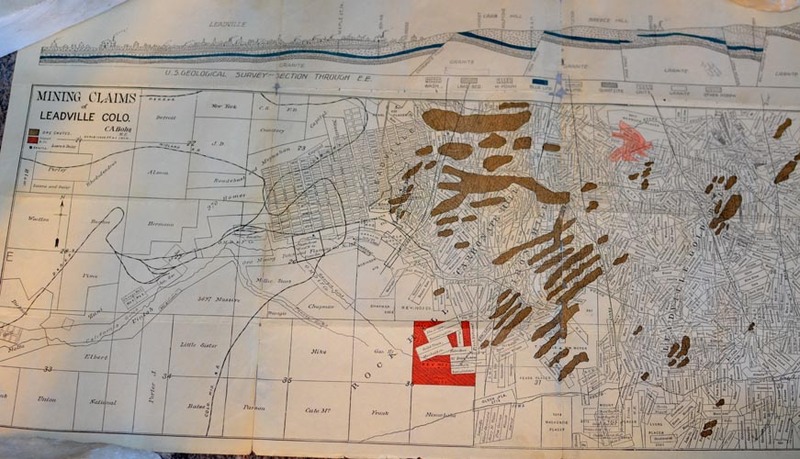 Decisions about development of the gold mining property, which was located in the CRIPPLE CREEK GOLD MINING DISTRICT, Teller County, Colorado, as well as business, expenses, acquisitions, transportation concerns, high-grading, etc. Condition: very good plus with a few loose pages. 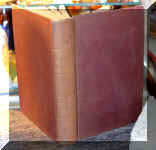 Legal-sized ledger from original cloth and red-leather binding and corners. 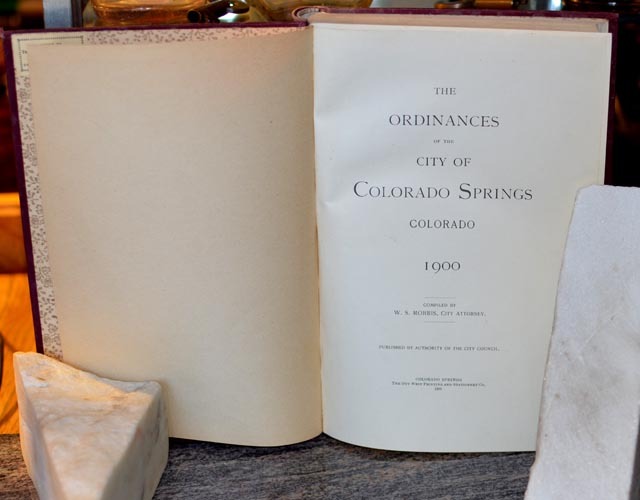 THE ORDINANCES OF THE CITY OF COLORADO SPRINGS, COLORADO, 1900. Compiled by W.S. Morris, City Attorney. Published by Authority of the City Council. Colorado Springs: The Out West Printing and Stationery Company, 1900. 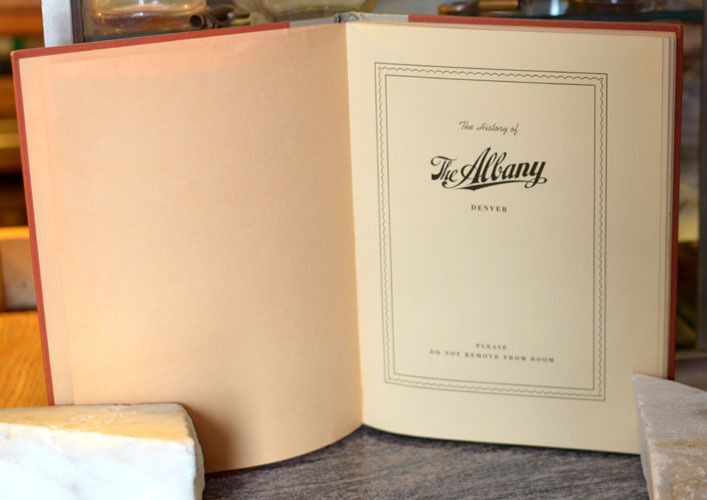 Original burgundy cloth covers with gold print on spine; 555 pages. Overall condition; very good plus with light sunning to spine. 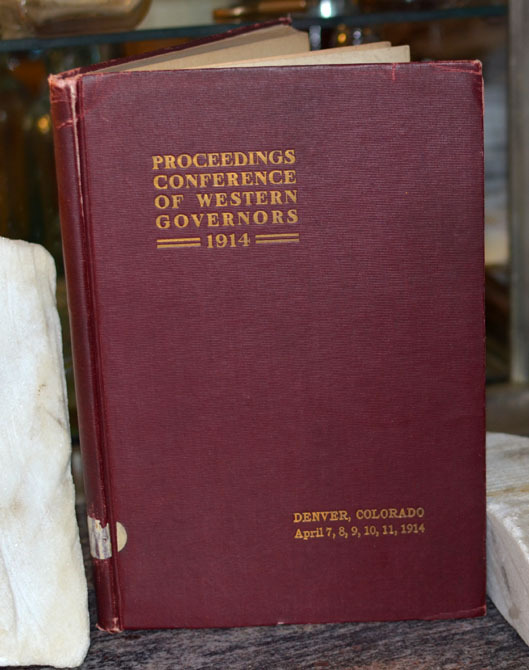 PROCEEDINGS OF THE CONFERENCE OF WESTERN GOVERNORS, Held at Denver, Colorado, April 7, 8, 9, 10 and 11, 1914. Reported by MacDonald & Osborne, Denver, Colorado. The Smith-Brooks Printing Company, State Printers: Denver, Colorado, 1914. 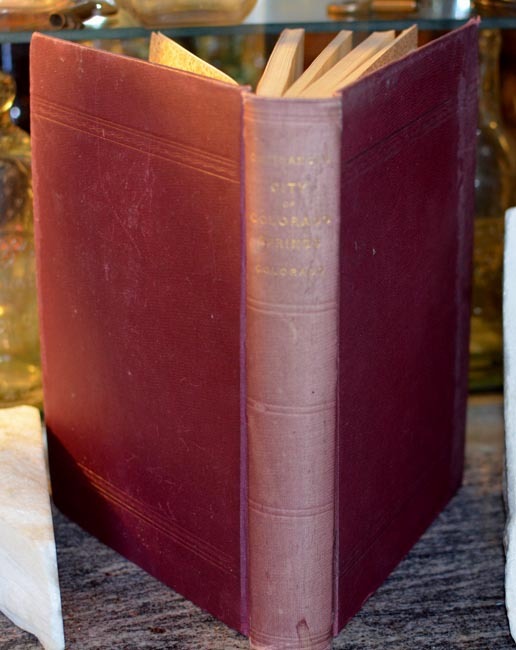 Original burgundy cloth binding with gold print on front cover; 116 pages; no illustrations. Contents include: Welcome Address by J.M. 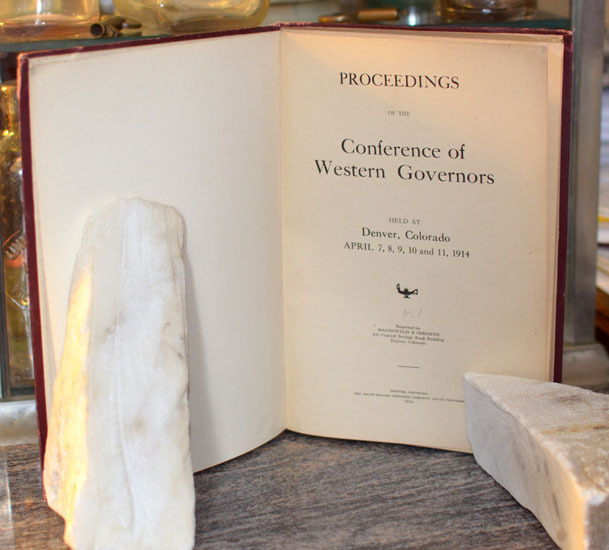 Perkins, Mayor of Denver; Welcome Address by E.M. Ammons, Governor of Colorado; Addresses by Oregon, Washington, Utah, Wyoming, Nevada, and Idaho governors; Discussion of Carey Act; Discussion of Shackleford Bill; Discussion on Regional Banks; Discussion of Leasing Public Lands; Address on "Water Power"; Address by Mrs. Harbert, President of the International Congress of Farm Women; and discussion of other topics related to Western State resources. 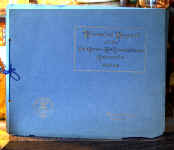 Ex-library book with bookplate on front paste and a few other unobtrusive markings. Condition: very good; tight binding, clean pages. 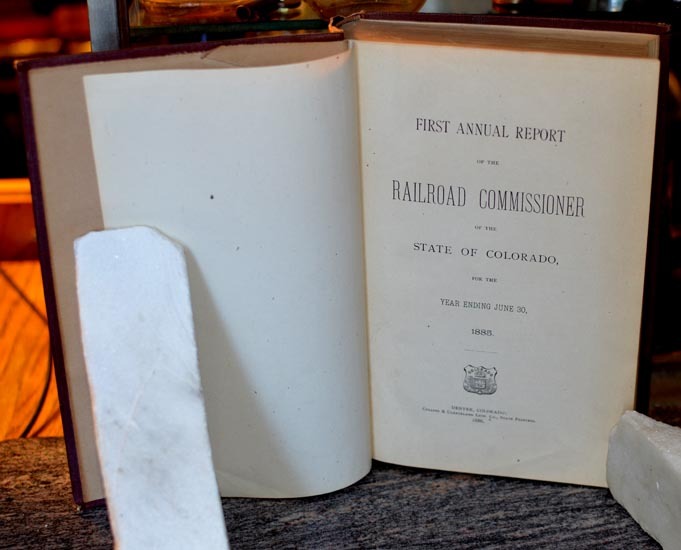 First Annual Report of the Railroad Commissioner of the State of Colorado for the Year Ending June 30, 1885. Denver, Colorado: Collier & Cleaveland Lith. Co., State Printers, 1886. 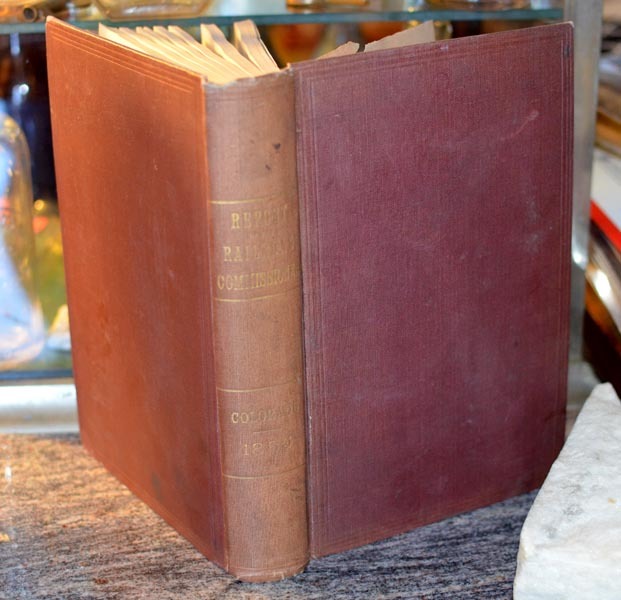 Original brown cloth binding with gold print on spine; 702 pages, with index. Includes rules, scope of report, stock, debt, stock and debt, cost, track in Colorado, curvature, sections, rails, ties, bridges, culverts, fencing, crossings, earnings and expenses, operating expenses, taxes, mileage traffic, passenger traffic, accidents, coal, etc. 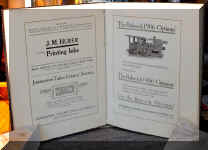 Very definitive report on all the railroads operating in Colorado in 1885, with specific reports on various railroads, such as: Denver Circle Railroad Company; Denver and New Orleans Railroad Company; Colorado Central Railroad Company; Denver, South Park & Pacific Railroad Company; Denver and Boulder Valley Railway Company; Denver and Middle Park Railroad Company; Greeley, Salt Lake & Pacific Railway Company; Georgetown, Breckenridge & Leadville Railway Company; Golden, Boulder & Caribou Railway Company; Union Pacific Railway Company -- Consolidated, etc. Complaints and Petitions submitted to the Railroad Commission, opinions and decisions. 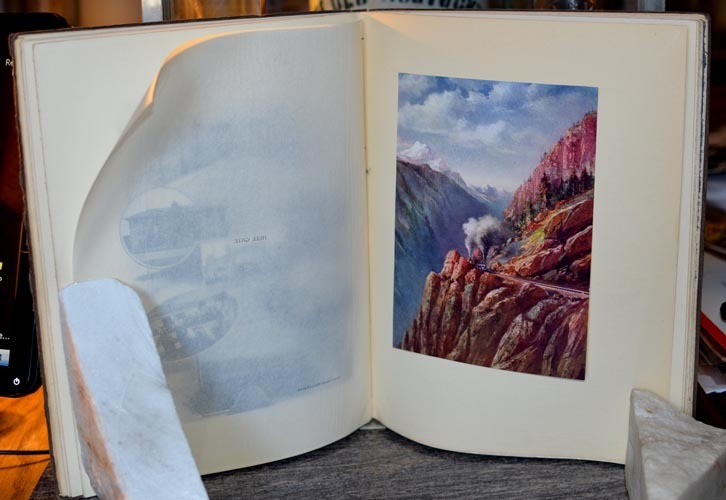 Vast amount of information on both well-known and little-known railroads operating in Colorado. 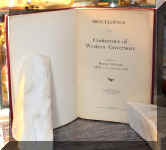 Condition: covers very good; sunned spine; interior pages generally very good. 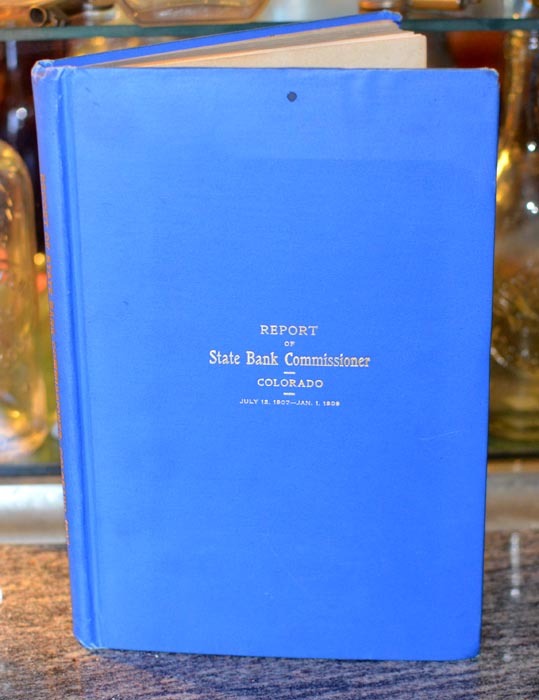 FIRST BIENNIAL REPORT OF HENRY M. BEATTY, STATE BANK COMMISSIONER OF COLORADO, from July 12th, 1907 to January 1st, 1909. Denver, Colorado: The Smith-Brooks Printing Company, State Printers, 1909. 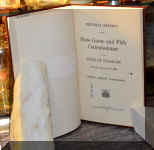 Original blue cloth binding with gold print on front cover; 191 pages. This report details new bank organizations, reorganizations of private banks, state or private banks nationalized, banks liquidated, and banks in the hands of receivers; increase of deposits, banks failure, savings banks, loans to owners of private banks, books and accounts, savings banks. 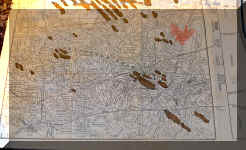 Details in individual banks in towns and cities throughout Colorado. Condition: near fine. 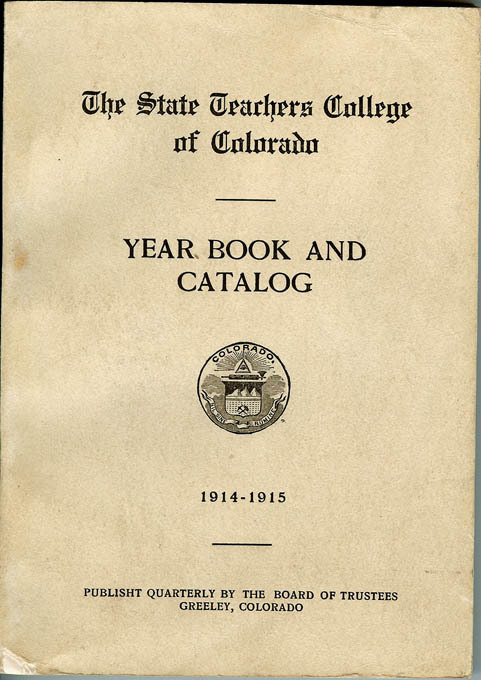 THE STATE TEACHERS COLLEGE OF COLORADO, Year Book and Catalog, 1914 - 1915. 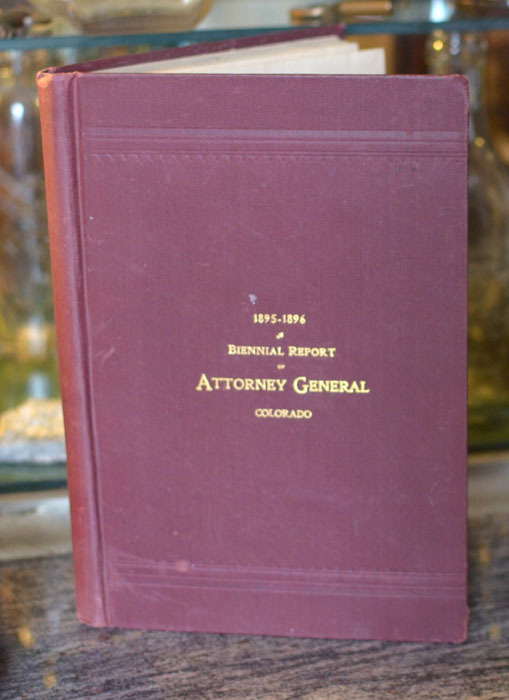 Published Quarterly by the Board of Trustees, Greeley, Colorado. Bulletin of The State Teachers College of Colorado, Series XIV, June 1914, No. 1. 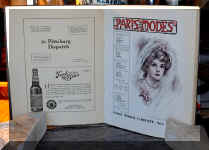 Original printed cream wrappers; 221 pages, plus index and photographic illustrations. Includes College Calendar, Board of Trustees, Faculty, Trustees and Committees. Details on subjects of study and coursework. 10 pages of photographs of College and grounds in front; 14 pages of photographs in back. Condition: very good plus to near fine. 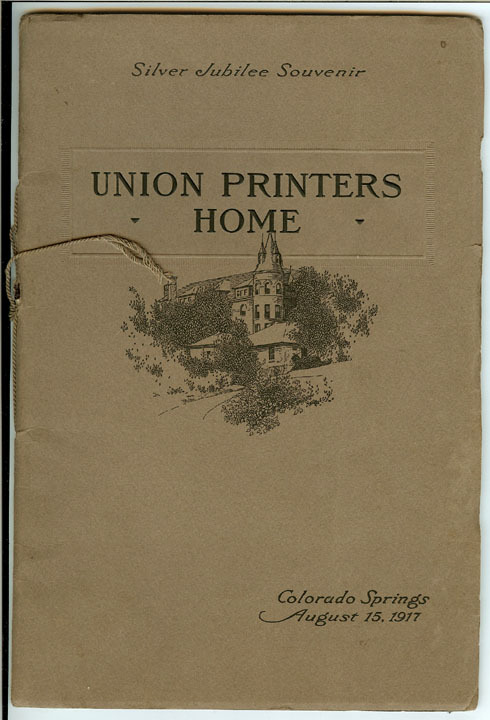 UNION PRINTERS HOME, Colorado Springs, Colorado. 52nd Annual Convention of The International Typographical Union. 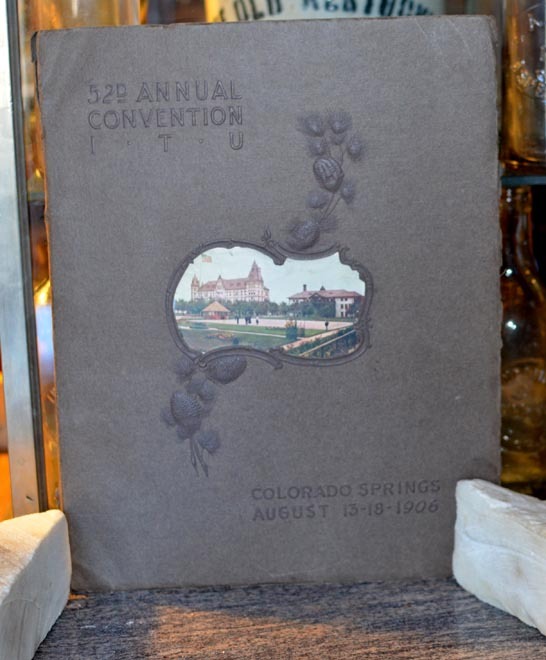 HOME CONVENTION SOUVENIR, International Typographical Union, Fifty-Second Session, August 13 - 18, 1906. Colorado Springs Typographical Union No. 82. The Prompt Printery, Colorado Springs, Colorado. Allied Printing Trades Council, Colorado Springs. 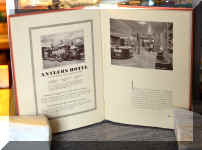 This oversized and highly impressive publication is in its original stiff brown covers with a tipped on chromolithograph of the Union Printer's Home of Colorado Springs on front; 120 pages. James M. Lynch, President, ITU; J.W. Bramwood, Secretary-Treasurer, ITU. 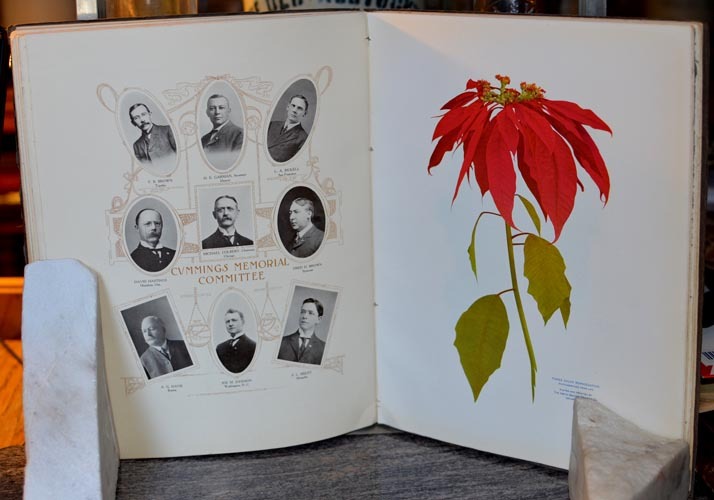 Includes numerous tipped in chromolithographs of Colorado scenes; "The Story of the Union Printers' Home (Colorado Springs, Colorado) by Henry Christeen Warnack; "A Struggle for Eight Hours and Peace" by James M. Lynch; "The Woman's International Auxiliary" by Mrs. Ed. D. Donnell; and others. All in all, this large publication was published to impress the members of the International Typographical Union -- people who every day saw published materials -- and it certainly does impress. SILVER JUBILEE SOUVENIR. UNION PRINTERS HOME TWENTY-FIFTH ANNIVERSARY, COLORADO SPRINGS (Colorado), August 15, 1917. International Typographical Union. Office: Newton Claypool Building, Indianapolis, Indiana. Photographs by Moorefield. 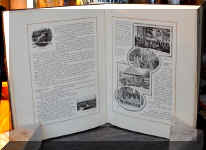 Printed by The Hollenbeck Press, Indianapolis. 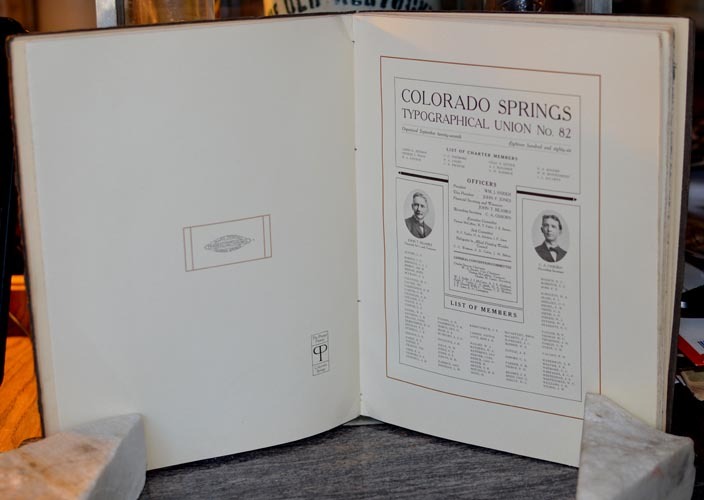 Original illustrated wrappers; 28 enamel-coated pages; 2 pages foldout to exhibit detailed photographs of buildings and grounds of Colorado Springs Union Printers' Home. Numerous photographs throughout of the facilities, buildings and grounds of the Union Printers' Home. History, addresses, staff of Home. Condition: near fine.